Today we walked through the city of David (David’s palace), stood on the Temple steps, and visited Bethlehem. My brain feels like I have hit overload. I will be processing this whole experience for months. But the thing that struck me today was immediacy. We were standing where David ruled, where Jesus taught and healed, where Mary gave birth to a tiny baby who would change the world. It all happened RIGHT HERE. 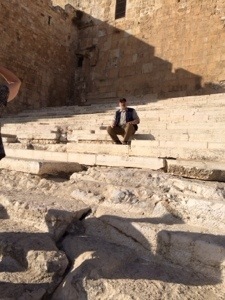 Above: Doug is sitting where Jesus would have sat. He is reminding us of Jesus’ words, teaching us as Jesus taught those who gathered to hear him so many years ago. It is a beautiful and powerful thing to be reminded that our faith is not something of storybooks or fairy tales. And though it happened long, long ago, it was not in a galaxy far, far away. Instead, it was here. In this warm, dry land. In this place that God chose to forever change the human race. It is possible to get to, to stand upon, to interact with the very places where Jesus lived, taught, died and rose again. 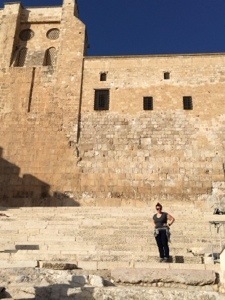 It is possible to touch the stones he touched and sit on the steps he sat on. That immediacy is important to remember, because sometimes we feel like God is far away. Sometimes we feel like it all happened so long ago, that who even remembers? But (to borrow a phrase and a book title from one of my favorite writers, John Ortberg) – God is closer than you think. He cares about what you are going through, he longs to be in relationship with you, he longs for you to choose to make a difference in His name by living a life shaped by the hope, peace, joy and love that He has made available to us through Jesus. As we stood beside the manger in Bethlehem, our guide encouraged us to sing Christmas carols. And it all became so very real once again. We are in advent. We are patiently awaiting the day on which we will celebrate the coming of the Christ child. And today, I stood with friends…with brothers and sisters in Christ…right beside the place where his mother laid him down. We lifted our voices because we know what I have just said – that God longs for us and loves us – and that is something worth singing about.